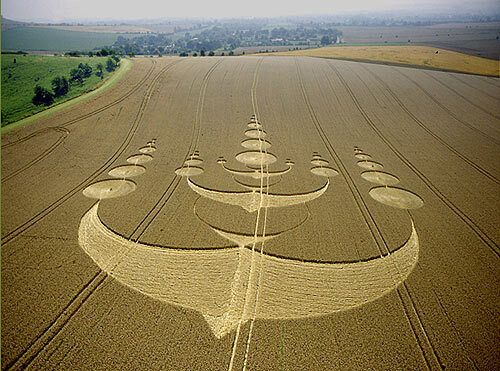 August 11, 2003 North Down, Wiltshire, England – Yesterday, a new 750-foot-diameter formation in wheat was reported between Morgan’s Hill and Cherhill Down directly east of the four tumuli and 11-concentric-ring formation of July 6, 2003 in North Down. 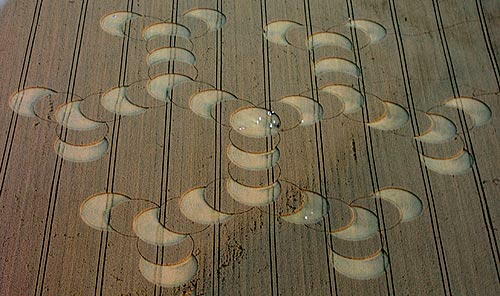 From the air, the pattern contained 61 circles that alternate dark and light – the light being flattened crop and the dark standing. The circles create a 3-dimensional object that has three branches that resemble a hexagonal-structured molecule. Since the July 6, 2003, North Down concentric ring formation , the July 13, 2003 Avebury Trusloe, and the August 3, 2003, Morgan’s Hill formations lined up on an axis that extends to Oliver’s Castle and Liddington Castle, we wondered if this new molecule formation would also line up. But after studying a map, photographer and video producer, Bert Janssen from The Netherlands, discovered that it was not. Bert Janssen, Agricultural Engineer, Photographer and Video Producer, Devizes, Wiltshire, England: “First, an update about the small circle that appeared on a hilltop near Morgan’s Hill earlier last week. I thought it was on the same line that went through the Avebury Trusloe formation and through Morgan’s Hill and North Down burrows, up to Oliver’s Castle. It’s not. It’s just off that line. But strangely enough, if you go from the top of the Morgan’s Hill survey stone through the small circle, you will land on Woodborough Hill. The first North Down formation of July 6, 2003, which lined up with the four tumuli, is a large disc of eleven concentric rings with circles of standing wheat which I think represent standing stones and made me think about Avebury. The new molecule formation reported yesterday does not seem to be on that alignment. But I can add some new information about the angle between the Morgan’s Hill stone marker and the hilltop circle. That angle is 78 degrees which is the same number of rays on the lower side of the formation. If you extend the axis toward the Avebury Trusloe formation and go on to Avebury, you get an angle of 28 degrees. That’s the number of rays on the upper end of the hill. So, Morgan’s Hill formation is lined up in a 78 degree angle and the Avebury Trusloe formation made a 28 degrees angle to Avebury. The line from Avebury through Avebury Trusloe towards Morgan’s Hill on to Oliver’s Castle, I think, has a Golden Mean ratio in it which means that somewhere near Oliver’s Castle there has to be a huge field and something is perhaps going to happen there. I don’t think the molecule is the last formation for Wiltshire in 2003. Large “Celtic rope” square spanning 300 feet, surrounding a central circle of eight curving blades created from “dots” of standing wheat, discovered Friday, August 8. Aerial photograph © 2003 by Nick Nicholson, cropcircleconnector. On Friday, August 8, 2003, I began the day by driving over to Woodborough Hill. As I approached the Tim and David Carson barnes at the base of the hill, two black, Apache helicopters were passing overhead. I was there to meet crop circle researcher, videographer and graphic designer, Andy Buckley, to gather some plant samples. He, an Australian and I had stayed atop Woodborough from sunset until midnight on August 7. There were definitely no formations in the crops around the hill when we left. But as we climbed the hill, we were shocked to see a huge new formation in the South Field at the northern base of Woodborough that had been untouched only a few hours before. During our night watch at around 11:30 p.m., Andy had walked down to the edge of the South Field and said he did a meditation asking for the phenomenon to place a formation there. Many people over the past decade have reported meditating or concentrating on certain fields with such requests and seeing results the next day. Did Andy Buckley’s meditation have anything to do with what occurred in the South Field? Or was it random chance that he walked to that field which now many people think was the target of hoaxers in the early, foggy, hours of August 8? I asked Bert Janssen about his reaction to the formation’s construction. “COULD YOU COMMENT ABOUT THE CONTROVERSIAL SOUTH FIELD FORMATION THAT WAS FIRST REPORTED ON FRIDAY, AUGUST 8, 2003? I liked it even though many are saying it was hoaxed. That’s a confusing thing because it is a very well performed hoax if that’s what it is. IS THERE ANYTHING ABOUT THE CONSTRUCTION OF THE SOUTH FIELD PATTERN THAT MAKES IT UNUSUAL? Several of us have compared it to the East Field formation reported a week earlier on August 2 which seemed to be a more obvious manmade pattern. The order of construction, based on studying the way the plants had been laid down or left standing in that one, was not the most logical to make it, in my opinion. I would have done it in a different way, an easier way. The one in the South Field, Andreas Mueller and Werner Anderhub thought was made in a similar fashion. WERNER SAID THAT THE SOUTH FIELD SORT OF HIT HIM AS POSSIBLY THE MYSTERIOUS PHENOMENON MIMICKING WHAT PEOPLE HAD DONE IN THE EAST FIELD, WHICH WAS RIGHT ACROSS THE ROAD. But then again, the molecule that is really good that we just got yesterday, has strange irregularities also. People will look at it and say it doesn’t make sense. It’s not regular. There should be six sided shapes in it, but they are crooked. You have to realize this thing could be a 3-dimensional representation. If you have a sheet of paper in front of you and look at it on an angle, you won’t see a rectangle. You’ll see it’s all crooked because you are looking at a 3-D shape. So, the crookedness of a formation is not the ultimate proof that it’s a manmade hoax. Walkers Hill, Wiltshire, “Swallows” reported August 4, 2003, in wheat below Adams Grave and the Alton Barnes White Horse. Aerial photograph © 2003 by Steve Alexander, temporarytemples.com. I think it is a very intricate design. It hits me somewhere deep inside. It’s very beautiful. You can sit on Adam’s Grave and look down on it and not look away for hours. Allan Brown has worked out its geometries that are on the cropcircleconnector.com. 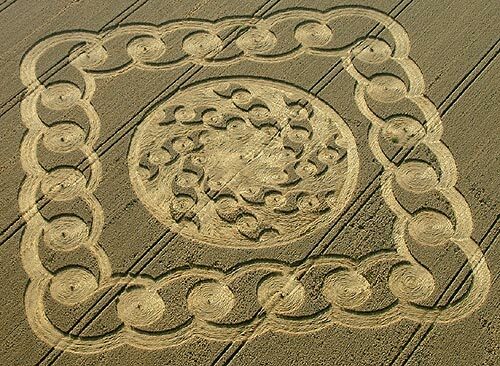 First he drew the large outer circle that circumscribes the entire crop pattern. 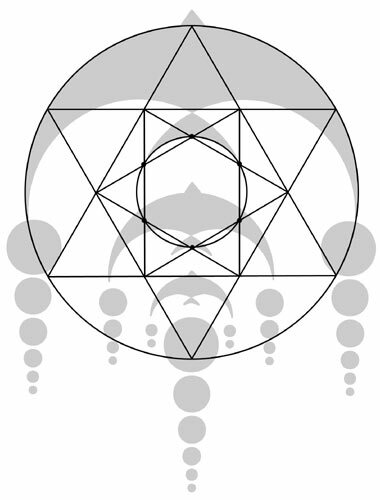 Within that circle, you can construct a Star of David and within that star, you can construct another Star of David. That one defines the center circle, which is fixed in size. 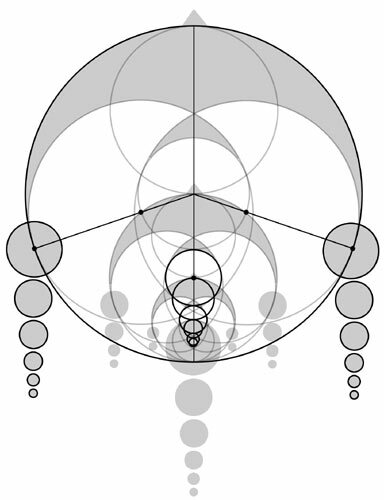 Diagram of the hexagonal geometry that is superimposed within the large circumscribing circle of the “Swallows” formation that defines the size of the inner circle and subsequent series of fractal circles that can be derived repeatedly from the smallest scale to the largest scale. Diagram © 2003 by Allan Brown. Now looking at the big circle, you can make two circles that are half the diameter of the big circle. Then overlaying circles define center points for creating other circles from which the entire Swallows pattern is created. IS THE REPETITIONS OF CIRCLES FROM THE SMALL TO THE LARGE WHAT MAKES THIS A PATTERN BASED ON FRACTAL GEOMETRY? Diagram of the fractal geometry in the “Swallows”formation. Diagram © 2003 by Allan Brown.